The Chicago river winds its way through the city and is a big part of the Chicago landscape. Every year on St. Patrick’s day the river is dyed bright green and every day there’s a collection of boats and kayaks on the water. For many years, the area that is now the Riverwalk was relatively undeveloped concrete paths. People could walk around and, in select places, sit down for a while, but there was no significant draw to the area. In 2016, Mayor Rahm Emmanuel converted the 1.25-mile-long path into a riverfront destination with restaurants, art installations, bars and more. Find out everything you need to know about the Riverwalk including what to do and how to get there. For many decades the Chicago river was best known for being so polluted that no aquatic life could survive. The river was integral in fueling Chicago’s industry but the sewage and factory waste being funneled into the waterway quickly turned it toxic. The river’s flow was reversed in 1900 to ensure that the water wouldn’t contaminate Lake Michigan but it took more than 100 years for it to be remotely habitable. In 2015 Mayor Emmanuel announced plans to revitalize the Chicago river, improving water quality, reducing pollution and making the river a bigger part of city life. One year later he announced the new Riverwalk. One relatively small portion of the river would become a new must-visit destination with highly-rated restaurants, museums and of course boat tours and water sports. In the years since opening, ten vendors have set up shop and the list grows each year. The Riverwalk goes along Wacker Drive from Franklin Street to the West and Lake Shore Drive to the East. If you’re taking the CTA, the State/Lake station is serviced by the Brown, Pink, Orange, Purple and Green lines. Walk one-block north on State Street and a walk down the ramp to the midpoint of the Riverwalk. The Clark/Lake station is a bit further West on Lake street and is serviced by the Brown, Blue, Pink, Orange, Purple and Green lines. If you would like to start at the beginning or end of the Riverwalk, you can take the 125 bus to the Wacker & Orleans/Franklin stop and walk the full 1.25-mile path in one go. If you’re taking the Metra, The Ogilvie Transportation Center is closest to the Westernmost point of Riverwalk. Walk north on Canal Street then turn right on Lake Street. At Lake Street, make a slight left on Wacker Drive and take the ramp to the Riverwalk. 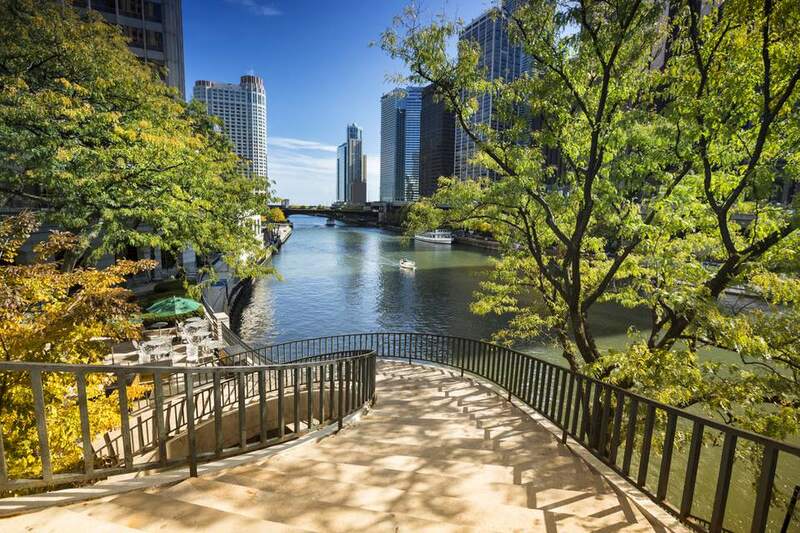 You could also go to Millenium Station, walk north on Michigan Avenue for three blocks until you get to the river and then take the stairs down to the midpoint of the Riverwalk. There are several accessible entrances to the Riverwalk; one by State Street, one by Clark Street and one by Franklin Street. If you’re driving there are plenty of paid garages in the area. There are also metered spaces on the Lowest Level of Wacker Drive, between Stetson Avenue and Field Drive, but be warned, it’s very easy to get lost on Lower Wacker Drive and many GPS systems have problems providing directions. The Chicago Water Taxi also makes several stops along the Riverwalk and goes as far north as North Avenue and as far south as Chinatown. One way tickets are $6 and all day tickets are $10. There’s plenty to do and see on the Riverwalk. It’s easy to spend a whole day here learning about Chicago architecture, eating and walking around. If you start at the Riverwalk’s west end one of the first things you’ll see are the floating gardens. These gardens are beautiful to look at but they also serve an important purpose. The plants are helping to purify the river water and thereby improving living conditions for the fish populations. Most of the businesses on the Riverwalk are seasonal eateries — meaning they close down during the cold months from November to April. There are small food stands like Frost Gelato, which serves the sweet Italian dessert and outposts of larger restaurants like City Winery. During the summer and fall, they set up tables where patrons can sip on a glass of sustainably produced wine and relax by the river. When the weather starts to drop in October, City Winery sets up a heated glass enclosure to keep diners warm. They also have igloo-esque River Domes available by reservation only for a more intimate dining experience. The Riverwalk location serves best-selling dishes from the West Loop location alongside their wine. A variety of cruises and water taxis dock at the Riverwalk. Enjoy a up-close and personal tour of Chicago’s many styles of architecture aboard the First Lady. Chicago Architecture Council-certified guides will share details about more than 50 buildings and buildings while guests marvel and sip drinks from the fully-stocked bar. Tours last 90 minutes and run daily from March to November. Tickets cost $49.48 and can be purchased online or in-person. The McCormick & Chicago Bridgehouse Museum offers visitors the opportunity to see the inner workings of a bridgehouse, including the huge gears that move the famed DuSable bridge up and down. At the top of the five-floor building, guests can enjoy 360-degree views of the city and the river. The first level and gear room of the museum are wheelchair accessible, meaning all visitors can see the DuSable gears, however the other four levels are only reachable by stairs. The museum is open Thursday-Monday from May to October, from 10 a.m. until 5 p.m. Admission is $6 for adults; $5 for seniors over 62, students and children ages 6-12. Children 5 and younger are free and admission is free on Sundays. To see bridge lifts, the ticket price jumps to $10, and tours of the tower are $8. If you’d like to get as close to the river as possible, head to Urban Kayaks at the east end of the Riverwalk. They offer tours and rentals to kayakers of all ages and skill levels, ensuring a fun water activity. You can witness the beauty of Chicago during the sunset or paddle through history on a 90-minute tour of historic buildings. Either of these tours cost $65 and a shorter introductory tour will run you $45. If you’d rather go it alone, there are also hourly kayak rentals for $30 per hour per person.